Can a high-stepping star of the London stage find happiness as the wife of a dignified college president? Find out when you visit The Halls of Ivy! 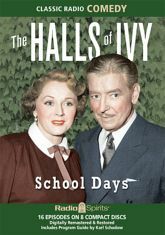 Ronald Colman and Benita Hume star in this gently-comic tale of academic life, where the kindly President Hall of Ivy College and the witty Mrs. Hall find themselves embroiled in the troubles and travails of their students, their staff, and -- every now and then - themselves. Here are sixteen delightful episodes of this erudite 1950s classic, bridging comedy and drama with the utmost class. Radio favorites Willard Waterman, Herb Butterfield, Gale Gordon, Arthur Q. Bryan, Alan Reed, Gloria McMillan, Elliott Lewis, and more bring the voices of the learned to life.